Built by the Birmingham Railway Carriage & Wagon Company for the Southern Region of British Railways these locomotives owe their design to that of the Class 26. Equipped with a Sulzer 8 cylinder engine the 33s also have electric train heating, a rather new innovation when they were built! The 8 cylinder Sulzer engine did not produce the same rasping thrash as their 6 cylinder counterparts. 33065 stands at Crewe with the 1939 service for Cardiff on 6th July 1984. Note the huge pile of mail waiting to be loaded. 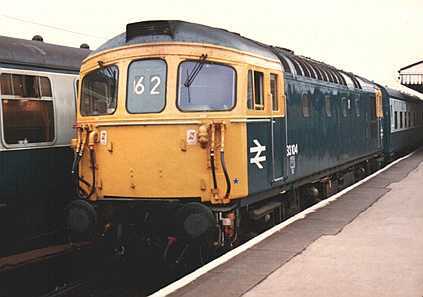 The 33s replaced Class 25s on these services, indeed some locomotives would spend quite some time away from their native region, usually returning when they had been broken! The station clock was indeed broken when the picture was taken by the way! 33023 leads 33044 away from Exeter St. Davids with the 1305 Paington - Brighton (1O86) of 28th August 1982. The class were regular performers to Exeter on trains from London Waterloo. Even after they were ousted by Class 50s they still appeared quite regularly due to the appalling reliability of the 50s. Nineteen members of the class were modified to work in multiple with the Southern Region's multiple unit stock. This was mainly 4TC trailer (unpowered) units between Weymouth and Bournemouth. High level piping and cabling was added which altered the appearance somewhat. 33104 stands at Basingstoke on 5th November 1983 with the 1010 Waterloo - Salisbury. 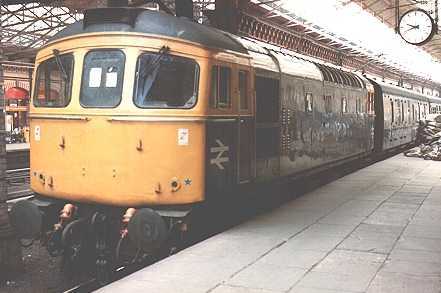 This was the first Class 33/1 to be withdrawn in December 1985 following a serious collision. 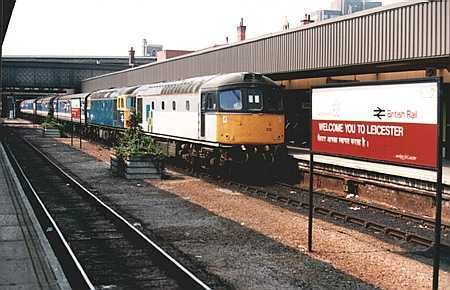 An incredible sight as 33021 leads 33022 into Leicester on 21st May 1989. 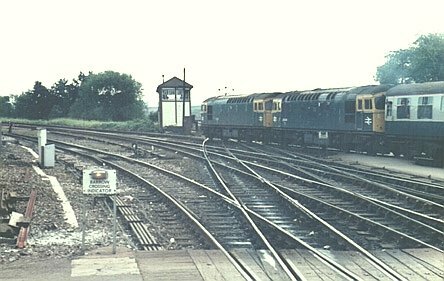 The occasion was an Inter-City diesel day when various trains on the Midland Mainline were hauled by a variety of locomotives not normally seen on the route.